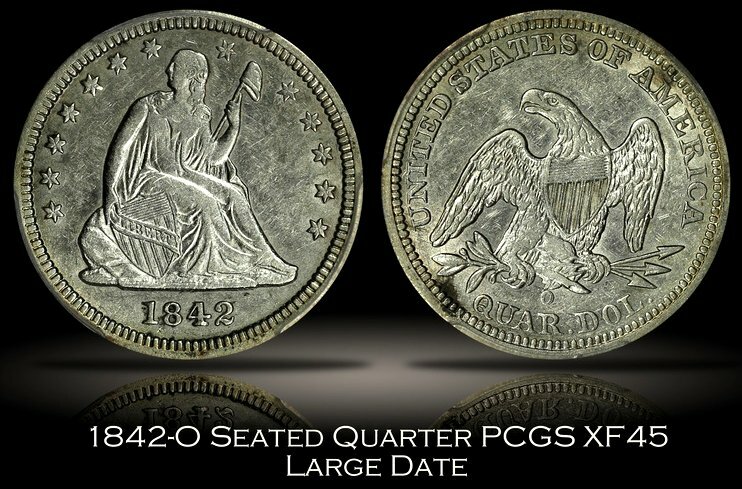 The 1842-O Large Date Liberty Seated Quarter is an interesting issue for many reasons. It is rare in problem free AU condition and very rare in mint state, despite being relatively common in lower circulated grades. High-grade examples, when found, tend to be quite well struck and proof-like. There are 8 die marriages listed in Briggs’ Comprehensive Encyclopedia of United States Liberty Seated Quarters (Lima, OH 1991), the majority of which are individually very scarce. Having accumulated 7 of the 8 die marriages throughout a nearly 10-year search, it grabbed my attention when collector Daryl Luke reported a possible new die marriage on the Liberty Seated Message Boards (http://seateddimes.yuku.com) in May 2013. The coin he reported appeared to be an example of Briggs 4-F, a known die marriage, but with an extremely long middle claw on the left (facing) foot. This feature was not known on 4-F coins and led to speculation regarding die state, die scratch, or new die altogether. The coin, pictured in Figure 1, resides in a PCGS XF45 holder. The discussion died out and the interesting anomaly was either forgotten or placed on a “back burner” by the discussion participants until Daryl discovered, and acquired, a second example (an ANACS EF40) having the same feature in December. Following a brief email discussion in January, Daryl shipped both coins to me. I retrieved the two 4-F examples in my collection from the bank and got out the microscope to see if there was a clear attribution that could be made. 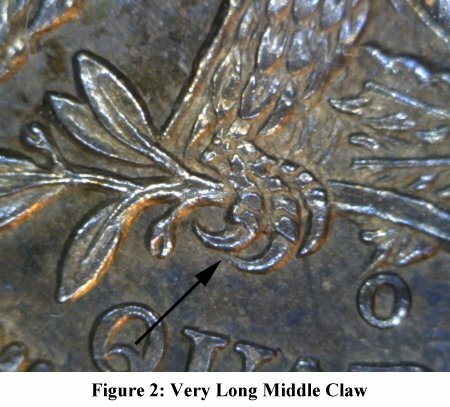 The first surprise was that my AU 4-F example has the exact same very long middle claw as Daryl’s two coins (Figure 2). As someone who studies and collects die varieties, and who as a result is very focused on each coin’s details, I must admit some embarrassment in completely missing the existence of such a notable feature on one of my coins. With three examples in hand I took a careful look at the fourth 4-F coin, a very late die state example in VF condition, and found no sign of the very long claw. Fortunately, the coin is sufficiently well preserved for a clear conclusion (requiring 30X magnification) that the very long middle claw variety is an early die state of Briggs 4-F. 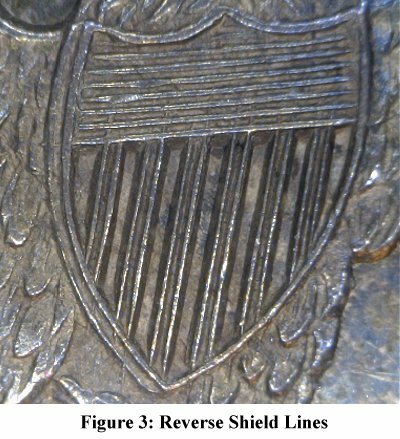 Reverse Attribution: The reverse dies for early date liberty seated quarter were hand engraved in a way that left the vertical shield lines overlapping with the horizontal shield lines, as well as frequently extending outside the shield boundary. The pattern of overlap between vertical and horizontal lines can serve as a “fingerprint” for a specific reverse die. The limitation of this attribution method is that it requires a well-struck and relatively high-grade coin to be effective. Nonetheless, in this particular situation all four of the coins have enough detail that, with the help of a microscope, it can be quite conclusively shown that all were struck from the same reverse die. Using the short hand that V1H4 means that vertical line 1 extends to horizontal line 4, the twelve vertical lines can be coded as follows: V1H4, V2H3, V3H4, V4H3, V5H5, V6H4, V7H4, V8H3, V9H3, V10H3, V11H3, V12H3. In addition, vertical lines 1 and 11 are “split” in the portion that extends into the horizontal lines, vertical line 4 extends completely below the shield and the lowest horizontal line extends outside the shield boundary to the left. These and other features of the shield lines can be used to uniquely identify reverse F and appear to be consistent on coins with and without the very long middle left (facing) claw (Figure 3). Obverse Attribution: The most common and obvious method of attributing obverse dies is date position. 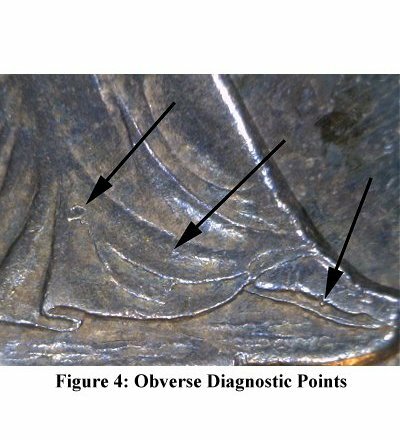 All four of the coins studied in detail have identical date position, but in addition there are some very prominent die rust lumps in Miss Liberty’s gown (Figure 4) that make it a simple exercise to verify coins grading XF or better. It was a bit of a challenge for the VF example due to wear that affects the raised die lumps, but still possible to confirm the obverse die with sufficient study. Rarity: Availability of 4 different examples of a single die marriage for in-hand examination is a rare treat for a seated quarter variety specialist. Despite this “embarrassment of riches” it seemed prudent and interesting to investigate further and try to find additional examples. The ever-useful Heritage Archive contains photographs of 74 examples of the 1842-O Large O quarter with sufficient resolution to attribute as 4-F or not based on mintmark position. Nine of those 74 (12%) are die marriage 4-F and 7 of those 9 have photographs with sufficient resolution to detect the very long claw. Three of those 7 examples appear to have the very long claw and 4 appear not to have the very long claw. One of the finest known 1842-O quarters, a PCGS MS64 that sold on 8/12/1999 and again on 4/17/2008, is the early die state of Briggs 4-F with the very long middle left (facing) claw. A rough, quick, and informal estimate of the number of very long claw examples that might exist can be made based on population estimates in Briggs. Assuming around 1200 examples of 1842-O Large Date quarters in grades F-AU, and around 10% of those, or 120, being die marriage 4-F, one quickly comes to a very rough guess of about 50 examples that might eventually be found. Late-late die state: One can speculate that the reverse die was polished between early (long claw) and late (no long claw) die states. In an even later state Reverse F becomes very heavily cracked as described in Briggs and shown in Figure 5. The coin pictured appears to be from a die approaching a terminal state. The shelf doubling pictured in the Briggs reference has not been seen on any of the eight examples of the die marriage seen in hand.